Ultimate powder & bronzer airbrushing applicator. 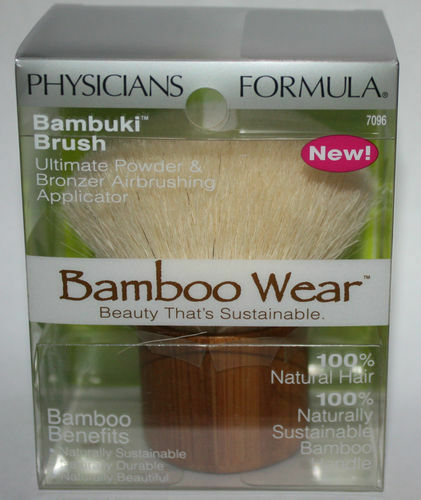 Bamboo Benefits: naturally sustainable; naturally durable; naturally beautiful. Beauty That's Sustainable: The ultimate airbrushing applicator, perfect for use with the Bamboo Silk Face Powder and Bronzer; Designed with a full head of luxuriously soft and densely packed natural hair for maximum pick-up of powder and effortless blending; Delivers medium to full coverage application for use all over face, on neck and decollete. Packaging That's Sustainable: Bamboo is a highly renewable resource and its natural sustainability, durability and beauty make it ideal for this everyday essential makeup application tool; Constructed with the highest grade of natural materials: 100% natural hair; 100% naturally sustainable bamboo handle.